As a developer, Double Fine may have one of the most consistently diverse portfolios in gaming. The studio has virtual reality games, graphic adventures, real-time strategy titles, 3D platformers, RPGs, and more. 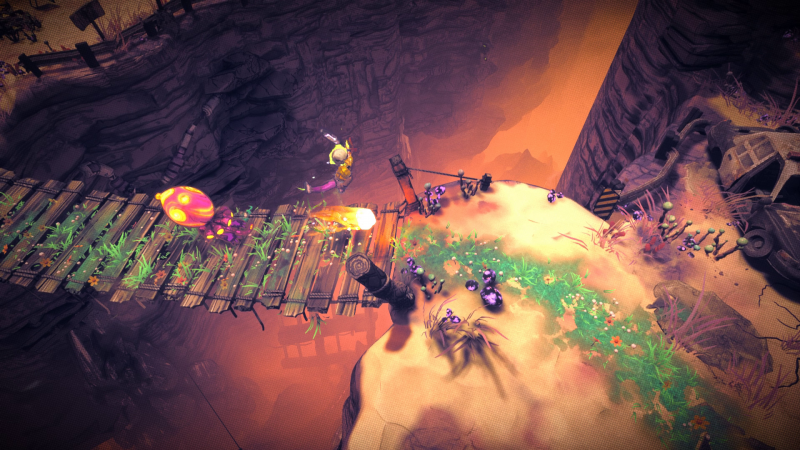 Double Fine constantly changes genres to work on new things and give their own spin on existing ideas. If only by the theory of diminished options, Double Fine would eventually find themselves ready to tackle the roguelite action genre, which they’re applying their trademark charm and personality to with their announcement of Rad. It’s the post-post-apocalypse, meaning that the world has been ended twice over, and isn’t in a good shape. Despite the toxic poison covering the wilds and the inevitable monsters produced by it, hope springs eternal. Thanks to effigies strewn about the wasteland called Respirators, there is a small chance that humans can once again move out of their settlements and encampments back into the rest of the world. To do that, however, requires brave youth sacrificing themselves by agreeing to activate those Respirators and fighting off the monsters along the way. To survive the poisoned atmosphere, the teenagers sent outside have to undergo an overhaul to their DNA which makes them susceptible to mutations from the radiation affecting the world. These mutations are essentially perks, giving the adventurous teens extra power in completing their quest. These mutations may manifest in ways like giving your player a cobra head which spits poison, a third arm that can be thrown and returned like a boomerang, eggs that hatch followers to attack your enemies, and more. During each run, you max out at three active mutations, each assigned to a button at your fingertips. You could end up with mutations that synergize extremely well together and destroy everything in your path or you could end up with three mutations that barely help you. The mixing and matching of possible mutations can have unforeseen effects, like becoming a Cobra person means your egg-babies also have tiny cobra heads, too. In addition, you can obtain an unlimited number of passive mutations that can also change your build up in different ways. Some passive mutations might add health, but only against certain elements like fire, and just remains on the side until or unless needed. Like other run-based roguelites such as Binding of Isaac, players can hope for the best, but it’s going to be skill that gets you across the finish line in the end. When a player dies, the run starts over back in the game’s origin town named the Fallow. One teenager didn’t make it, so another teenager takes up the mantle, but can buy supplies, buy upgraded weapons, or withdraw from the bank before they go. In concert with the various shops throughout the game, players will see progress between runs to help do things like forge and create better baseball bats to have less reliance on the randomness of mutations. One side effect of the DNA blending machine the teenager becomes is that, as they traverse the wasteland, grass grows under their feet Okami-style. The grass stays on the ground for the entire floor, meaning you can always tell where you have been without having to memorize each procedurally-generated map. 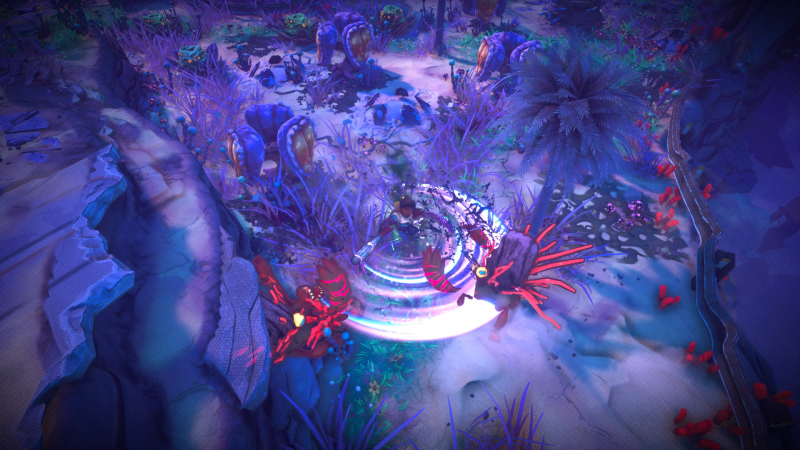 The grass also helps in battle – the teenagers move faster when walking on grass, which means that you need to move and strafe around enemies rather than stay in one place. Rad has an immediate and obvious 1980s rock ‘n’ roll style, aggressively bouncing between Mad Max and Heavy Metal in its influences. Director Lee Petty explained that he simply loves that style and era and it definitely fits with the aesthetic of a radioactive wasteland. 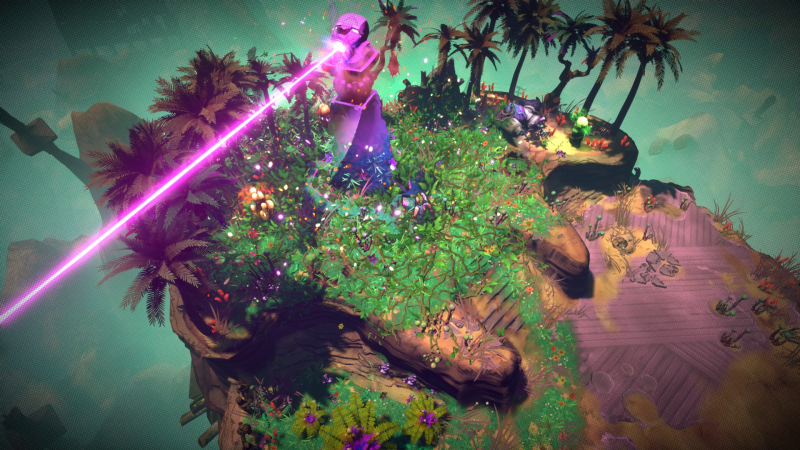 According to Petty, the game also has a bit of a message about the older generation sacrificing the younger one for their own mistakes with society and the environment. While it’s relevant in modern times, Petty points out that it was relevant in the 1980s, too. It is the kind of trope that unfortunately never really goes out of style. Over the course of the game, the environments will vary, so you won’t just me crossing the desert for the entire journey. 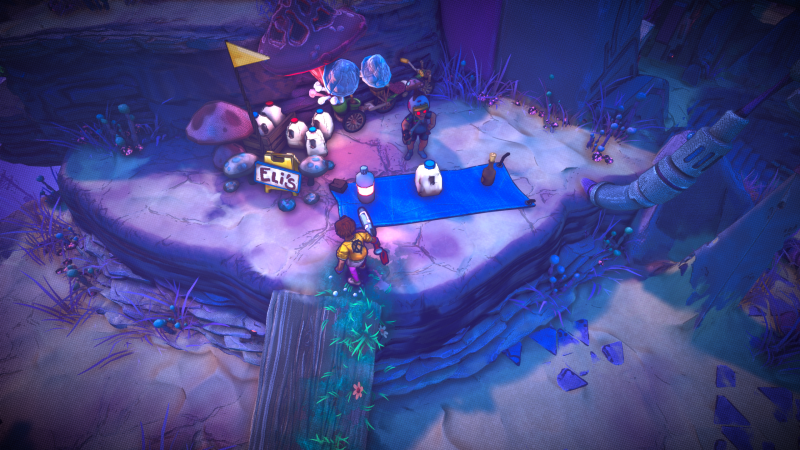 While I didn’t get a chance to see the other biomes, Double Fine explained that venturing further into the game will start revealing lore about the game’s prior two apocalypses. A mysterious teenage girl narrates your expedition, which will also be explained more as you proceed to unlock respirators. Much like the player backtracking over the grass trail behind them, Double Fine’s Rad is certainly not reinventing anything in the genre. It is very much in the same vein as games like Binding of Isaac or Dead Cells, but with enough personality that it will probably keep players interested for the length of the adventure. It won’t be long until everyone can find out how rad it is for themselves when Rad releases this summer on PlayStation 4, Xbox One, Switch, and PC.